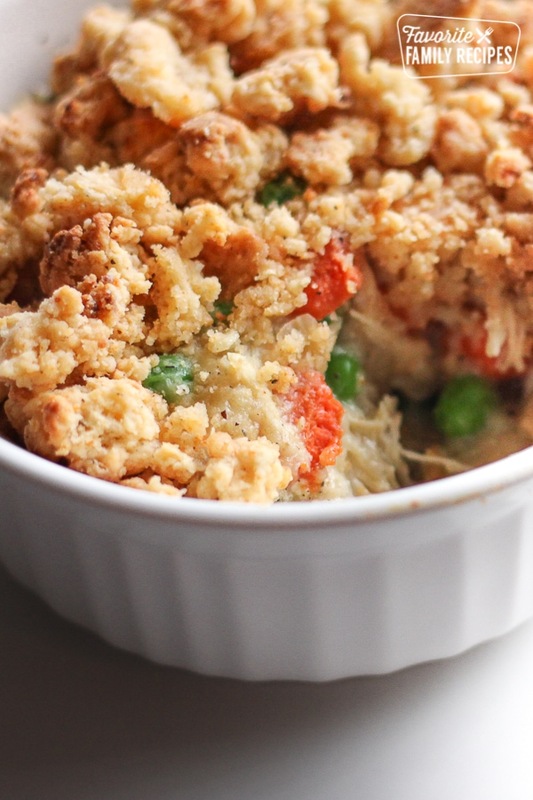 Chicken Pot Pie Crumble has a traditional creamy chicken and vegetable filling with a flavorful crunchy parmesan crumble topping. A favorite family dinner! Simply put by my husband, “This Chicken Pot Pie Crumble is by far the best chicken pot pie I have ever had!” I agree. The crumble topping is a nice change from using a pie crust. I got the idea from watching “America’s Test Kitchen” and adapted the recipe from there. The crumble topping is what makes it, but if you simply must have a pie crust, you can just use the filling recipe. What makes the filling recipe so good is that you don’t use any “cream of” soups.. In my opinion “cream of” soup ruins a good chicken pot pie! Bring chicken and broth to simmer in covered Dutch oven over medium heat (If you don't have a dutch oven, just use a stock pot). Cook until chicken is just done (8 to 12 minutes). Transfer cooked chicken to large bowl. Pour broth through fine-mesh strainer into liquid measuring cup and reserve. Do not wash Dutch oven. Combine flour, baking powder, salt, pepper, and cayenne in large bowl. Sprinkle butter pieces over top of flour. Using fingers, rub butter into flour mixture until it resembles coarse cornmeal. Stir in Parmesan. Add cream and stir until just combined. Crumble mixture into irregularly shaped pieces onto a baking sheet. Bake at 450-degrees until fragrant and starting to brown (10-13 minutes). Set aside. Heat 1 tablespoon oil in now-empty Dutch oven over medium heat. Add onion, carrots, celery, salt and pepper. Cover and cook, stirring occasionally, until just tender (about 5 minutes). While vegetables are cooking, shred chicken into small bite-size pieces. Transfer cooked vegetables to bowl with chicken; set aside. Heat butter in empty Dutch oven over medium heat. When foaming subsides, stir in flour and cook 1 minute. Slowly whisk in reserved chicken broth and milk. Bring to simmer and stir until sauce thickens, about 1 minute. Add salt and pepper to taste. Remove from heat and stir chicken-vegetable mixture and peas into sauce. Pour mixture into 9x13 pan (or if you have small individual-sized oven-safe dishes, you can use those-- see picture above). Scatter crumble topping evenly over filling. Bake at 400-degrees until filling is bubbling and topping is well browned (about 12-15 minutes). Serve hot and enjoy! In any case, it all sounds wonderful and perfect for these snowy days. And I am completely with on on not adding the "cream of" condensed soup! I love this recipe and I make it all the time. I always use half milk and half cream for the topping, just like you mentioned. It turns out great! I also use half whole wheat flour for the biscuits and it adds a nice brown color but tastes the same. I am so happy to see this recipe! I shy away from chicken pot pie because I don't feel like making a pie crust. This is the answer to all my problems! oooh this is so much easier than making a crust! I can't wait to make this! I made it for dinner last night, super yummy. I couldn't agree with you more about the "cream of …" soup, it just ruins it. This is easy and tasty. Thank you. Maybe I missed it, but what temp. do you bake it at? I baked it at 350. Whoops! I forgot to put the oven temps on there! I will put them on right now. It is 450 for the crumble and 400 for the rest. Thanks for catching that! I found your blog about a week ago and cannot stop looking at it! Thanks for all the great recipes! I can't wait to get started cooking! Everything looks so good. Looks amazing! I will be making this during our next snow storm tomorrow. What a wonderful site! Great Job! And that chicken crumble looks amazing!! I just came across this blog and I LOVE it! The pictures are beautiful and we had the Chicken Crumble tonight! YUMM!!! Thanks! This recipe looks so YUMMY! I wonder if it would freeze well? This looks AWESOME! Can't wait to make it tonight. Do you know if it would be fine to use salted butter instead of unsalted because I only have salted. Amazing recipe, my family went bananas over it. I used salted butter and didn't have to add any salt at all, or pepper for that matter. Are you using fresh Parmesan cheese? @ Platt Lucky 7 – You can use fresh, but no, I just used the plastic canister stuff..
We definitely found a new one to add to our recipe box of comfort foods!! Thank you. Thanks. We just found a new comfort food for our family recipe box. My family loves this recipe! We have tried other great ones from your blog, too, but this one is our favorite! It is now a staple in our regular dinner time rotation. Thank You! And you bet I'll be checking in for more scrumptious ideas. This is exactly like a recipe out of America's Test Kitchen. Did you adapt it from them by chance? @Marci– Yes I did. If you look at my comments before the recipe I gave them the proper credit. I love that show! I have never frozen it before. Probably just freeze before putting the crumble topping on. Thaw completely before putting it on and baking. Made this for the first time tonight for company and it was DELICIOIUS!! Everyone enjoyed it! Thanks so much for another great recipe!! Please add me to your list of recipes and daily mailing. Thank you in advance. I know I am going against the grain on this one, butI view chicken pot pie asan old time comfort food. We make it because we want that taste. I simply cannot imagineputting cheese anywhere near it! This country has been obsessed with cheese for much too long. It isno wonder so many people have heart disease. The cheese would be really easy to omit if needed. I am sure it would still taste great! I would say it serves about 6-8… depending on how hungry people are!